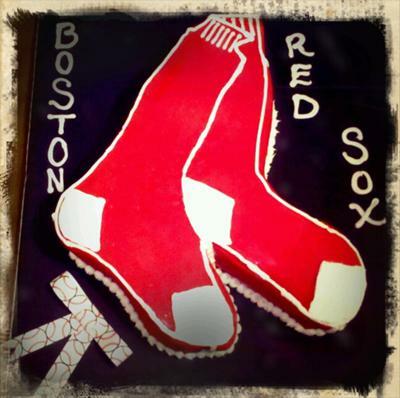 To make this Boston Red Sox cake, I first covered a cake board with navy and added a baseball ribbon along the sides and I also created a bow. I baked two 12x18 chocolate sheet cakes and let them cool completely. I filled and the cakes with a raspberry buttercream icing. I created a sock template with parchment paper and used that to carve the cakes into the shape I needed. I crumb coated the cakes with the raspberry buttercream. I rolled out red fondant and covered the socks. I then piped a out-line around the socks and piped a dot border with vanilla buttercream. Finally I secured my cake onto the board with buttercream and then I piped the writing.